Big churches and small churches design their budgets very differently. While large churches spend their time balancing percentages, designing requisition sheets, and tracking an increase or decrease of giving as one measurement of the church’s health, small churches deal with an entirely different set of issues. For instance, I just Googled “what percentage of a church budget should be salary?” and I found several helpful articles. This is good advice, based on years of experience and sound stewardship principles. But those percentages mean nothing in most small churches because the smaller the church, the more likely you are to fall into the “every church is different” part that they mentioned. While 45 to 55 percent of budget going to staff is healthy for mid-size to larger churches, the range is much wider for small churches. As in zero to one hundred percent. While 45 to 55 percent of budget going to staff is healthy for mid-size to larger churches, the range is much wider for small churches. 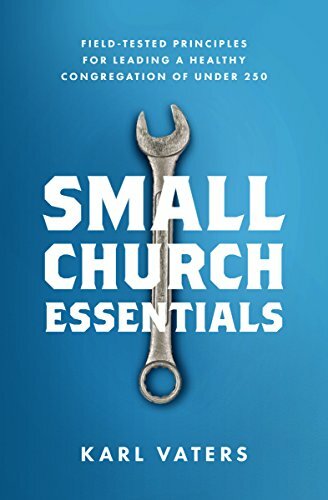 There are healthy small churches in which no money goes to staffing costs at all (house churches and bivocational pastors, for instance), and healthy small churches where every dollar in the budget goes to pay the pastor’s salary. No, those pastors aren’t draining the church dry, it’s just that in some situations the church may not have a building or other overhead, so everything that goes through the official budget pays the pastor’s meager salary, while all ministry expenses are done off-book. Not underhandedly, just on a more personal level. This is Stewardship 101. No matter how big or small the church is. As I’ve mentioned in several previous articles, spending money you don’t have isn’t faith, it’s bad stewardship. Most bills come monthly. But every church has annual bills (like insurance) that we have to stop being surprised by. Any healthy church anticipates these bills and plans for them by laying some money aside every month so it’s there when the bill inevitably arrives. As I wrote in a previous post, a small church budget process is less likely to start with a question like “what is our vision and how will our budget reflect that?” than “how much money came in last year?” and “are we on an upward or downward trend going into next year?” Then we set up next year’s budget from that baseline. This very idea is sending shivers of horror through the hearts of every financial planner – especially if you’re used to working in midsize to larger churches. But that’s reality in smaller congregations. So what do we do with that as our starting line? Set up a budget based on a lower-than-expected income. This makes it easier to live within our means. We need to set up a budget based on a lower-than-expected income. This makes it easier to live within our means. Churches need to do our best to anticipate annual increases in costs we can’t control. Some examples include health insurance premiums, energy rates, and so on. It’s better to set funds aside for an increase that doesn’t occur than to be surprised by an increase yet again this year. In many, maybe most churches, there’s a regular ebb and flow to attendance and giving. If, for instance, you know that your church is going to receive more money in December, but less income in the summer, factor that in to your planning. Lay money aside during the high income months so it’s there for the low income seasons. Heaters break. Roofs leak. Regular givers lose their jobs and move away. Wise church leaders plan for such eventualities. No matter how little we have coming in, we need to create a line item to create a fund to cover such emergencies. Especially if we own assets that need to be maintained, like a church building. At minimum, if we’ve underestimated our income and overestimated our outgo, and we end up with a small amount of unspent money because of that, it should go into the emergency fund. According to most financial experts, an ideal amount in that fund would be six months’ worth of income. (Yes, I can hear you laughing from here. Our church doesn’t have that either). In lieu of that, we should aim for three months’ worth. We can get there by setting up a budget that saves one month’s worth of income every year until the three months of income is reached. That can be done by setting aside eight percent of your income every month for three years. Don’t let deferred maintenance build up. Having an annual cleanout of the plumbing lines will be cheaper in the long run than letting things build up until the toilets overflow in the middle of a Sunday morning service. The same goes for cleaning, painting, cracked windows and so on. One of the biggest mistakes small churches make with budgets is designing them in a back room, then announcing it as a done deal to the people who have to live with it. The smaller the church, the more important it is to seek input and wisdom from the people who are doing ministry. For instance, don’t assume you know what the nursery needs, ask parents and workers what they need. Then factor that into the budget process. The smaller the church, the more important it is to seek input and wisdom from the people who are doing ministry. Not only will you get a more accurate understanding of what ‘s needed, you’ll get more cooperation from the ministry members when their concerns have been acknowledged. A strong budget can be a wonderful servant, but it’s a terrible master. While we need to factor finances into our planning, we can’t let money make our ministry decisions for us. For more on this, check out my previous article, How To Give Money Less Power Over Your Church.